Dr. Matthew Mariola led discussions on the major on Dec. 1 and 5 in Lowry Student Center (Photo by Saeed Husain). 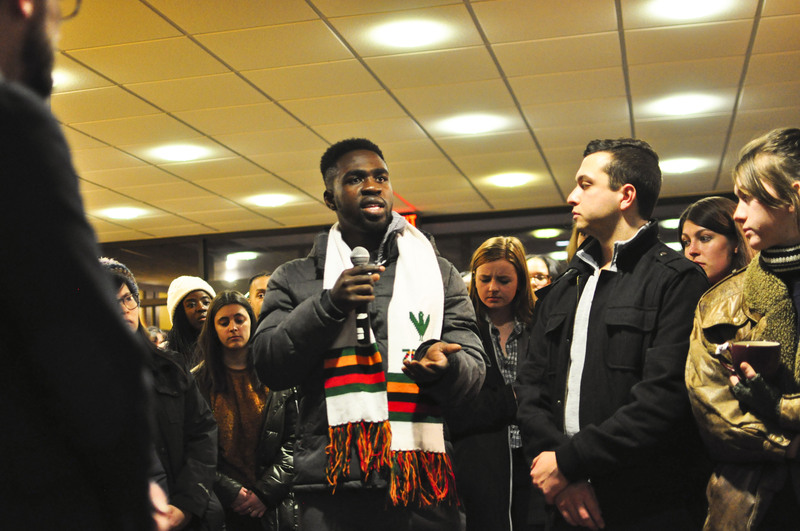 On Sunday, Jan. 14, students, staff and faculty of the College gathered in Lowry Pit at 8 p.m. to discuss the impact of Facebook posts made by Drake Schwenke ’18 with racist language and arguments targeting African-Americans and Latinx and Jewish people. According to an email to the College community by President Bolton, more than 300 people were in attendance. At the gathering, Bolton spoke first on the incident, and then the microphone was passed to students in an open, forum-style discussion. Students of color emphasized that these Facebook posts are only the latest in a string of daily racist occurrences. “This was not a one time incident; however, this is the first time the administration has been forced to deal with it,” said Khorkie Tyus ’19, vice president of the Black Students Association (BSA).